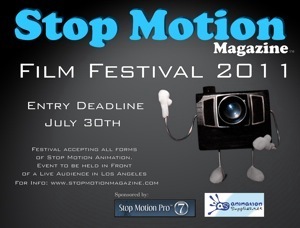 This years Stop Motion Magazine Film Festival 2011 will be reducing the entry fee for films 5mins to 10mins from $35 to $25 per film. We will also be giving College Students a discount with valid student ID, student entry fees will be $15 for each film entered. We have a new item in our free section of the website. You can now download and use for any type of production the 6 shot storyboard template.